This recipe is so quick and so simple. The semisweet fudge base has only 2 main ingredients, chocolate and a can of sweetened condensed milk. This recipe yields a sweet, smooth, impossibly easy, foolproof fudge. I like to add a little butter, salt and vanilla for extra flavor but it can also be made with out them if necessary. I added a top layer of white chocolate fudge that I divided into 4 different flavors to create a flavored fudge variety pack out of just one easy batch. 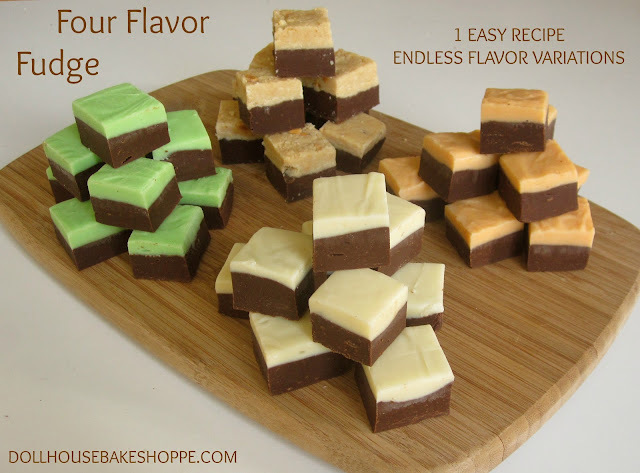 These little fudge bites are so easy to make and so versatile, you can choose any combination of flavors your desire for your perfect fudge variety pack. Cut traditional squares of fudge or pour it into mini cupcake liners for perfectly portioned, self-packaging, bite-sized pieces. These are also great to make for parties, work/school, or to give out as gifts because they can be served and packaged up in little flavor variety packs so easily for a perfect treat. Simply melt the semisweet chocolate, 1 cup sweetened condensed milk, butter and salt and spread evenly into your prepared pan. Divide fudge into 4 sections by pressing strips of folded wax paper into place. Divide white chocolate chips and remaining sweetened condensed milk in 4 heat proof cups/bowls. Melt one at a time and stir in one flavor variation listed above into each cup. I chose chocolate peanut butter, mint chocolate, chocolate orange and chocolate coconut. Spread each flavor evenly over each section of your semisweet chocolate layer and smooth with the back of your spoon or spatula. Chill in the refrigerator until firm. Lift fudge out of pan. Slice off edges for perfect, clean looking squares, using a sharp knife. ... or cut into bite size squares. 1/2 cup mix-ins, optional: chopped nuts or candies, marshmallows, shredded coconut, Oreo cookie pieces, rainbow sprinkles, pretzels, M&Ms/Reese's Pieces, toffee, dried cranberries/cherries, crushed peppermints, rice krispies, etc. Extracts: Add 1/2 teaspoon flavored extract to melted white chocolate. Add a few drops of food coloring to distinguish flavor if desired. Chocolate Orange Fudge: Add 1/4 teaspoons finely shredded orange peel OR 1/2 teaspoon orange extract and a few drops orange food coloring to melted white chocolate. Top with orange candy slices or candied orange peel if desired. Chocolate Espresso Fudge: Add 1/2 teaspoon espresso powder to melted white chocolate. Top with chocolate covered espresso beans. Confetti Fudge: Add 1 tablespoon rainbow sprinkles to melted white chocolate. Mint Chocolate Fudge: Add 1/2 teaspoon peppermint extract and a few drops of green or red food coloring (if desired) to melted white chocolate. Top with peppermint candy pieces. Chocolate Coconut: Add 1/2 teaspoon coconut extract to melted white chocolate. Almond Joy Fudge: Add 1/2 teaspoon coconut extract and 1 tablespoon chopped almonds to melted white chocolate and top with sweetened shredded coconut if desired. Chocolate Strawberry Fudge: Add 1-2 tablespoons strawberry preserves to melted white chocolate. Chocolate Maple Fudge: Add 1/2 teaspoon maple extract to melted white chocolate. Red Hot Chocolate Fudge: Add 1 tablespoon crushed red hot candies and a few drops of red food coloring to melted white chocolate. Chocolate Caramel Fudge: Add 1-2 tablespoons melted caramel chew candies or caramel topping to melted white chocolate. Line an 8-inch square pan with wax paper that extends over the edges for easy removal. Melt semisweet chocolate, 1 cup sweetened condensed milk, butter and salt in the microwave for 30 seconds at a time on 50% power, stirring until smooth (May alternatively use a double boiler or bowl over a pot of simmering water). Cool slightly and stir in vanilla extract and mix-ins if desired. Spread evenly into prepared pan. Divide fudge into 4 sections by pressing strips of folded wax paper into place. Divide white chocolate chips and remaining sweetened condensed milk in 4 heat proof cups/bowls. Heat one at a time in the microwave for about 15-30 seconds until stirred smooth (do not over cook as white chocolate can easily burn!) and stir in one flavor variation listed above into each cup. (Alternatively melt white chocolate and remaining sweetened condensed milk in a double boiler, divide into 4 cups/bowls stir in one flavor variation above into each cup.) Spread each flavor evenly over 1/4 of your semisweet chocolate layer. Garnish with toppings, if desired. Chill in the refrigerator for 2 hours or until firm. Remove from pan by lifting the wax paper up. Cut into squares and serve or package for gift giving!